We often find that there is a strong personal connection between identity thieves and their victims. They might be family, friends, work colleagues, or neighbors. They might also simply be a complete stranger who went through the garbage or a hacker from a faraway land. Why do individual thieves commit these crimes? Usually, they are driven by mental illness, desperation, or simply, greed. There are also organized crime rings, however, who come together for the sole purpose of taking the money of others. The criminals who make up these crime rings break into networks, steal data, and then use it to take over established accounts. In a matter of hours, they can max out a person’s credit card, transfer funds, and even take everything from financial accounts. How Do Cyber Criminals Hack? Hackers use a number of tools to hack into accounts, and typically, they use these tools to seek out vulnerabilities. The hack might happen through an internet connection, through the operating system, or through a browser. In the early days of hacking, a criminal would create a virus that crashed a hard drive or deleted files, but this doesn’t happen anymore. These days, these criminals do the opposite; they want computers to run as efficiently as possible. They infect the computer with a virus, which will stay dormant until activated by the criminals. Many of these are called Trojan viruses, which can detect when a victim is logging into their bank’s website. When the victim logs into their bank, the virus is essentially activated, and it collects information for the hacker. Just like the viruses that affect the body, the computer virus can stay in the machine for a long time until it is called to action. We might visit a certain website, download a specific program, or even click on a link in an email. These actions trigger the virus to activate and steal information. The number of active viruses has quadrupled over the years, and the technology used by the hackers is evolving so quickly that it’s difficult for the good guys to keep up. In days past, organized crime was all about the muscle, and these groups were involved in activities such as gambling, loan sharking, prostitution, and drugs. 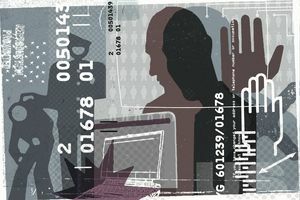 Though this stereotype is still alive these days, the leaders of these groups have learned that it is easier to start doing cybercrimes than it is to participate in traditional activities. They use hackers to crack these databases, and then, as criminals often do, they take over accounts that already exist or open up new accounts. Meanwhile, the victim is unaware of what is happening. The actual definition of cybercrime in some ways refers to the theft of information, such as trade secrets, personal details, or even state secrets. These crimes became well known after hackers began breaking into databases that are full of information, such as Social Security numbers or other information. This data is then used for crimes such as espionage or identity theft. Cybercrime is an extremely lucrative business, and it is showing no sign of slowing down. In fact, over the past 10 years, these criminals have created more sophisticated ways to capitalize on those who use the internet, and the odds are slim that they would get caught. The ‘I Love You’ Worm: This cybercrime caused an estimated $15 billion in damage, and it was released in 2000. This worm was transferred to a computer after users opened an email with the subject line, “I love you,” and then downloaded an attachment, and then spread as a virus does. This attachment turned out to be a virus that affected individuals, companies, and even government agencies. The MyDoom Worm: This cybercrime caused approximately $38 billion in damage, and it was released in 2004. This worm delivered spam to email addresses around the world, and it slowed internet access around the globe by about 10 percent, and in some cases, access to some websites was reduced by about 50 percent. The Conficker Worm: This worm took the internet by storm in 2008, and it caused just over $9.1 billion in damage. This worm took the damage caused by the “I Love You” worm and the MyDoom worm by first downloading, and then installing, malware, which gave the criminals remote access to the computers of the victims. Why Do Cybercriminals Go After Certain People? Some people might wonder why a cybercriminal would go after them instead of someone else. The truth is, a cybercriminal is going to go after the information they can get most easily via an unpatched network or a social engineering scam. They look for birthdates, Social Security numbers, addresses, names, and any other personal information. Additionally, they are seeking out credit card accounts, bank accounts, and any other information that can be sued to open a new account or take over an account that already exists. If they can get paid, they are going to seek out this information. In the past 70 years, our Social Security numbers have become the main way we identify ourselves. These numbers were issued beginning in the 1930s as a way to track a person’s income for Social Security benefits. However, these numbers started to serve in a way that they were not intended to. Over the next few decades, these numbers literally became the keys to our identities. We are required to give our Social Security numbers in many cases, and for most of us, our Social Security numbers are included in hundreds, if not thousands, databases, records, and files…and an untold number of individuals have access to them. If the wrong person gains access to these numbers, they can easily steal an individual’s identity. How Do Cybercriminals Go After Their Victims? You know that our personal information is accessible from numerous databases, and a cybercriminal will access this information by seeking out any vulnerabilities in the networks that host the information. Think of your own home or office. If the wireless internet connection in these locations are not secure, you are making yourself vulnerable. Is the OS on your computer up to date? If not, you are vulnerable. Is your browser updated with the latest software? If not, you are vulnerable. Do you play games online or visit risky websites? You are vulnerable. Have you ever downloaded movies, software, or music that has been pirated or engage in other illicit activities online? You are vulnerable. Even if you have all of your security software in place, that doesn’t mean every other site is safe. If you buy something online, for instance, and the website is not secure, you are vulnerable. If you give your Social Security number to a company that is secure, you might believe you are safe, but if just one of their employees open up a phishing email, it can compromise the network, which once again, makes you vulnerable. Cybercriminals will target everyone and anyone, regardless of the level of security that is in place. Any company that offers credit must have a name, date of birth, address, and Social Security number to run a credit check and verify identity. This includes organizations such as insurance companies, banks, hospitals, car dealerships, credit card issuers, department stores, and others. Today, it is more common than ever for criminal hackers to get into the databases that contain our Social Security numbers. Of course, they then use these numbers to open new accounts or take over existing ones. A criminal can use these Social Security numbers to obtain credit cards, bank loans, and even credit cards. Some of these victims will even become involved in a scam where their mortgage gets refinanced without their knowledge, which robs them of the equity they have in their home. Those who have no savings, poor credit, no credit, or an empty checking account are not immune to cybercriminals. These people only need a Social Security number to open an account, even with a poor credit history. There are businesses that will open up a new account for a customer regardless of their credit history, they simply charge them a high-interest rate. A cybercriminal can use a Social Security number to open a bank account, too. These people deposit the minimum amount, like $50 or $100, obtain a checkbook, and then they can write checks for any amount in the victim’s name. The technology we use each day has become an indispensable part of our lives. We often rely on our personal computers and the internet to take on various tasks, and this is increasing all of the time. However, as more people rely on the internet than ever before, cybercriminals are dedicating even more time and attention to finding increasingly innovative ways to exploit this security. Even as the security professionals are fighting hard against this, the bad guys are seeking out easy ways to access the networks. It is up to each of us to step up and start protecting our own identities. This might mean we have to shred every document with identifying information on it, install locks on our mailboxes, investigate identity theft protection, or only use our Social Security numbers in situations where they are absolutely necessary. The issue of identity theft and cybercrime will not get any better any time soon, and in fact, it is likely to get much worse.